Homosexuality is not the only sin mentioned in 1 Corinthians 6:9–10. It’s not the only sin mentioned, but it is different from all the rest, at least right now. At this moment in history, contrary to the other sins listed here, homosexuality is celebrated by our larger society with pioneering excitement. It’s seen as a good thing, as the new hallmark of progress. To be sure, the masses increasingly make no bones about sin in general. Innumerable people are idolaters, not to mention those who are sexually immoral, or who commit adultery, or who steal and are greedy and get wasted and revile neighbors and swindle others. It happens all the time. And each of these unrepentant sins are the same in the sense of God’s judgment. They all deserve his wrath. And we’re constantly reminded that “such were some of you” (1 Corinthians 6:11). But as far as I know, none of those sins are applauded so aggressively by whole groups of people who advocate for their normalcy. Sexual immorality is no longer the tip of the spear for the progressive push. Adultery is still frowned upon by many. Accusations of greed will still smear a candidate’s political campaign. Thievery is still not openly embraced, and there are no official initiatives saying it’s OK to go steal things that don’t belong to you. There’s no such thing as a drunk agenda yet. Most aren’t proud to choose a beverage over stability, and there aren’t any petitions that the government should abolish the driving restrictions of inebriated individuals. Reviling others still isn’t seen as the best way to win friends and influence people. Swindling, especially on a corporate level, usually gets someone thrown into jail. In fact, the infrastructure of the American economy depends upon, in some measure, our shared disdain for conniving scammers. Perhaps excepting fornication, these sins are still seen in a pretty negative light. But not homosexual practice, not by those who are now speaking loudest and holding positions of prominence. According to the emerging consensus, homosexuality is different. As Christians, we believe with deepest sincerity that the embrace of homosexual practice, along with other sins, keeps people out of the kingdom of God. And if our society celebrates it, we can’t both be caring and not say anything. Too much is at stake. This means it is an oversimplification to say that Christians—or conservative evangelicals—are simply against homosexuality. We are against any sin that restrains people from everlasting joy in God, and homosexual practice just gets all the press because, at this cultural moment, it’s the main sin that is so freshly endorsed in our context by the powers that be. Let’s hope that if there’s some new cultural agenda promoting thievery—one that says it’s now our right to take whatever we want from others by whatever means—that Christians will speak out against it. The issue is sin. That’s what we’re against. And that’s what should make our voice so unique when we speak into this debate. Some would like to see this whole issue of homosexuality divided into two camps: those who celebrate it and those who hate it. Both of these groups exist in our society. There are the growing numbers, under great societal pressure, who praise homosexuality. We might call them the left. And there are people who hate homosexuality, with the most bigoted rationale and apart from any Christian concern. We might call them the right. The current debate is plagued by this binary lens. Those on the left try to lump everyone who disagrees with them into that right side. If you don’t support, you hate. Meanwhile, those on the right see compromise and spinelessness in anyone who doesn’t get red-faced and militant. If you don’t hate, you support. But true followers of Christ will walk neither path. We have something to say that no one else is saying, or can say. Distancing ourselves from both the left and the right, we don’t celebrate homosexual practice, we acknowledge God’s clear revealed word that it is sin; and we don’t hate those who embrace homosexuality, we love them enough to not just collapse under the societal pressure. We’re not the left; we say, this is wrong. And we’re not the right; we say, you’re loved. God tells us we’re wrong, that the wages of sin is death, that unrepentant rebellion means judgment, that our rescue required the cursed death of his Son (Romans 3:23; John 3:36; Galatians 3:13). And God tells us we’re loved, that even while we were sinners, Jesus died for us, that while we were unrighteous, Jesus suffered in our place, that though we were destined for wrath, Jesus welcomes us into glory (Romans 5:8; 1 Peter 3:18; Ephesians 2:1–7). You’re wrong and you’re loved—that’s the unique voice of the Christian. That’s what we say, speaking from our own experience. That’s our message in this debate, when society’s elites despise us, when pop songs vilify us, when no one else has the resources to say anything outside of two extremes, we have this incomparable opportunity to let the gospel shine, to reach out in grace: You’re wrong and you’re loved. We get to say this. That’s why homosexuality is not like other sins. This entry was posted in Commentary and tagged different, homosexuality, sins on January 30, 2017 by Brother. The Bible portrays sin as a powerful, ever-vigilant enemy. Sin deceives (Genesis 3:13), desires (Genesis 4:7), destroys (Genesis 6:7). Even forgiven sin within the Christian is powerfully active, waging war (Romans 7:23), lusting (Galatians 5:17), enticing (James 1:14), entangling (Hebrews 12:1). Here are four strategies for maintaining vigilance in the fight, drawn from John Owen, and particularly in relation to a nagging, persistent sin—that kind that keeps on tripping us up and entangling us in its grip. If we do not feel the magnitude of our sin, if we are not gripped by its stench and grossness, if we pass over it lightly with glib affirmations of grace—we will probably never get around to the serious vigilance required for killing it. Truly subduing it requires properly grieving it. • This impatience is part of what Christ had to bear on the cross. • This worldly ambition would lead me to hell, but for the grace of God. • This lingering resentment grieves the Holy Spirit within me. Often this means really slowing down and really examining our hearts. In a lesser-known passage in his Surprised by Joy, C.S. Lewis, reflecting on the distinction between enjoyment and contemplation, observes that “the surest means of disarming an anger or a lust (is) to turn your attention from the girl or the insult and start examining the passion itself.” Defeating nagging sins often requires this uncomfortable, honest reflection and acknowledgement on what the sin is doing within us. 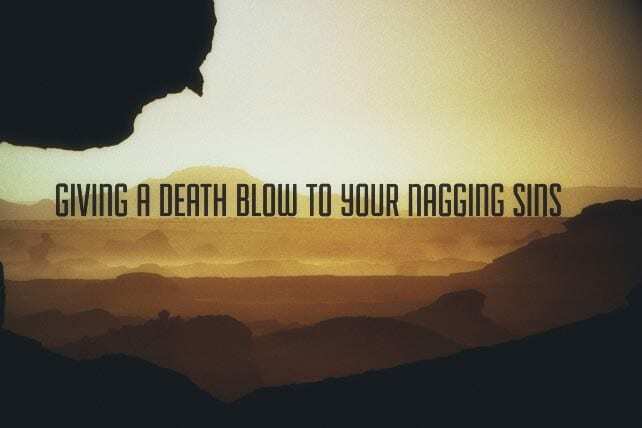 Nagging sins can survive our annoyance and mild dislike. Only hatred will fuel the needed effort. In one of my favorite films, a man is diagnosed with schizophrenia and told that several of his lifelong friends are actually not real. He genuinely misses talking to them, but knows he must stamp out all delusions in order to move toward health. So he simply chooses to ignore them, calling it a “diet of the mind”—and as he does, they gradually recede in their influence over him. Even at the end of his life, he still sees the delusions, but they have lost their destructive power over him. There is a similar principle at work in our struggle against sin—the more we indulge in it, the more of a grip it gains over us (even while we understand that grip less and less). But, as with any addiction or animal, the less we feed it, the weaker it becomes. “Resist the devil, and he will flee from you” (James 4:7). Choose not to acknowledge your sinful desires—starve them of your affections and your attention, and they grow weaker. Consider what ways, what companies, what opportunities, what studies, what businesses, what conditions, have at any time given, or do usually give, advantages to your distempers, and set yourself heedfully against them all. Men will do this with respect unto their bodily infirmities and distempers. The seasons, the diet, the air that have proved offensive shall be avoided. Are the things of the soul of less importance? Know that he that dares to dally with occasions of sin will dare to sin. He that will venture upon temptations unto wickedness will venture upon wickedness. This means we need to study the particular triggers of sin in our lives. It could be a geographical location (like a bar if you’re a recovering alcoholic), but I find it’s more commonly emotions and unhealthy habits that we need to avoid. Lust is greatly weakened when it cannot appeal to fatigue, emotional need, loneliness and shame. It’s more difficult to succumb to envy when you’re soaking your heart in your heavenly inheritance. Sinful anger often melts away when you are spending time with exceptionally kind, forgiving people. In short, an effective fight against a nagging sin will often involve thoughtful consideration to your sleep, exercise, diet, emotional life and relationships. In the gospel, God has given us the resources that we need to deal with nagging sins. Let me just mention three: patience, pardon and power. The gospel means that God has “perfect patience” (1 Timothy 1:16) for us even amidst our struggles with nagging sins. To truly kill a nagging sin, we need to know that God has not given up on us. Even when we have lost patience with ourselves, he is still there, like the Prodigal’s loving father, calling us back to obedience and joy. Set faith at work on Christ for the killing of thy sin. His blood is the great sovereign remedy for sin-sick souls. Live in this, and thou wilt die a conqueror. Yea, thou wilt, through the good providence of God, live to see thy lust dead at thy feet. Gavin Ortlund (@gavinortlund) is a husband, father, associate pastor at Sierra Madre Congregational Church, and PhD candidate at Fuller Theological Seminary. This entry was posted in Commentary and tagged nagging, sin, sins, spiritual, victory, warfare on May 9, 2016 by Brother.